Most of us suffer with some form of time poverty; it is difficult to fit all the necessary things into our day. Gardens can be time consuming, and in some seasons need a large amount of upkeep. Weeding, pruning, training, these can all have a beautiful effect in a garden, but take a lot of time and energy. The temptation is to concrete or pave over a garden to minimise the impact on our time. But these can look stark, cold and unwelcoming. A low maintenance garden need not be paved over completely. 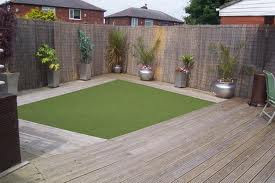 With a few ideas you can create a garden you will enjoy being in but with the minimum of work. ShrubsThese break up the garden, provide large sections of greenery and in some cases some beautiful blossoms. Arranging these in clusters in your garden provides a break from large squares of lawn. GrassesGrasses provide variety to shrub bed areas and are easy to look after. These are available in a variety of shades so you can provide contrast. ConifersThese grow quickly, and provided they are trimmed fairly regularly need little maintenance. By designating a large part of your garden to a living area with decking you can have a barbecue and relaxation area complete with outdoor recliner sofas, minimising the amount of greenery in the garden but still leaving enough to enjoy. By adding graveled areas and stone paths you can again minimise greenery yet provide a pretty focal point which is useful within the garden. There are other effects which can be created using bark chips, and stone or slate chips which can provide a design element in itself. Try a few potted shrubs arranged in an area layered with slate chips for a truly breathtaking but effortless look. This is one of the best gardening inventions ever created. Simply lay the black fabric around the plants or shrubs you wish to keep and the fabric will block sunlight from the soil, preventing weed growth. This can save hours of constant weeding. 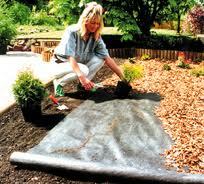 Simply cover with bark chips and you have a solution to irritating weeds. There are plenty of design ideas out there, with a few practical solutions you can create a garden which will give you pleasure. Instead of working for your garden make it work for you. the Weed Control Fabric caught my attention. it'll be very useful for our garden. weeds keep on growing and you need to allot time to pull them out. wish that's available here in the Philippines.